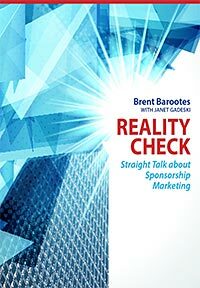 Someone asked me recently, “Can you run your organization effectively on sponsorship revenue?” I answered, “You can if your assets are of value, but I would not recommend it.”Properties need to diversify their revenue channels. This may mean sponsorship revenue combined with philanthropic gifts, merchandise sales, fees for service, ticket sales and so forth. Putting all your eggs in one basket is always risky. For comparison, I look at Hollywood. In years past, the revenue from cinema sales was the bulk of the money the investors said was their payback for the millions they invested in production. Then they diversified and included branded marketing opportunities, where Burger King or whomever might sponsor or partner with a movie or character. And then there were the merchandise sales that came along with a great movie production. The problem is that this was all, or mostly, post-release revenue. So Hollywood looked for upfront money. Sponsorship was the solution. So product placement sponsorships came into the limelight. The new James Bond flick will generate $45 million of its $150 million budget from product placement sponsorships. One third of the production costs will come in that way. This sets a new record for product placement sponsorships. Previously, the record was $20 million for Steven Spielberg’s Minority Report. Not only does Hollywood do this, so do television, Broadway and anyone else who can! As a selling property, you need to diversify your revenue channels. As a brand, you need to know what level of influence you can yield or deliver if you make such an investment. The question becomes, “Can brands sustain this level of investment? What is the turning point?” Perhaps, as discussed last Tuesday, it all comes down to measuring ROI for the brand sponsor’s investment.